A stroll through Dolgellau before breakfast and a puncture repaired gave us quite an appetite for that important meal. It was 10am (as usual) before we took leave of our Sheffield friends (who were going to Dinas Mawddwy) and started along that lovely road towards Bala. The day was another scorcher, and the gradual ten mile climb proved hot work. In a little glen near Dwrs-y-Nant we stopped by the side of a broiling stream – the Afon Union – and cooled ourselves in the best possible way. Dropping now, we left the shady woods behind for the open air, getting the full force of the sun on our heads. Near Llanuwchllyn some tar spraying caused us a lot of trouble, little stones sticking all over us. A grassy bank was resorted to and half an hour spent in cleaning ourselves up and then dozing etc. At last we came to Bala lake, and running alongside it we reached Bala town. The Bull Bach Inn was still standing, and lunch was available. How different from that wet, sloppy evening last Good Friday! In a cool room we chatted for over an hour with a traveller from Chester and a cycle tourist from London–CTC. When we started it seemed hotter than ever, and we welcomed the tree-shaded road that ran by the River Dee, in the Vale of Penllyn. After a while we started climbing until we were on the hillside with the fertile Vale of Edeyrnion below us. Down to Llandrillo, then up again, what a wonderful road it was! Twisting and turning, climbing and dropping, narrow, and quite devoid of motors, and all the while this lovely valley smiled upon us. All too soon we dropped down on to the Holyhead road at Corwen, where the Crown Hotel made us a good tea – as at Easter. 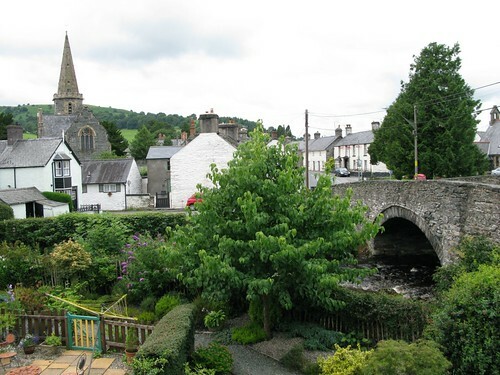 On the road again, we pedalled towards Llangollen – on the Holyhead road. At first the scenery was below standard, but as we got further on the country became brighter. Past Carrog we began to rise evenly. A big, wooded hill, Moel-y-Geraint got in the way, and we described a big horseshoe as we climbed round it. Llantysilio and Berwyn passed, we made a wild dive downhill, right into Llangollen itself, and then found some ‘digs’ for the night. Leaving the bikes we hired a boat on the canal, and after many adventures we turned in.